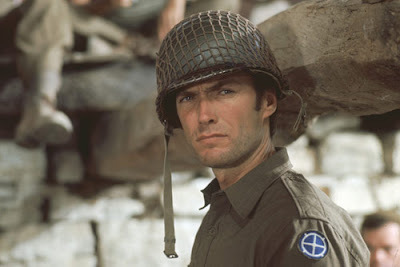 As Clint Eastwood told Richard Schickel, “...when you sign on, you sign on for the whole ride.” And from the earliest days of Rawhide up through time spent playing such cinematic icons as The Man With No Name in Sergio Leone's spaghetti westerns or Dirty Harry in Don Siegel's action-packed series along with his recent directorial masterpieces such as Mystic River, Letters from Iwo Jima and Million Dollar Baby, it's safe to say that Clint Eastwood has been on one hell of a ride. 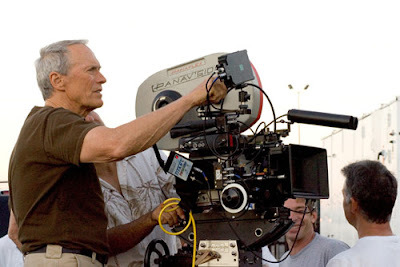 Likewise, the ride has become a wholly encompassing cinematic one as well, finding Clint taking on various behind-the-scenes and on-camera roles. 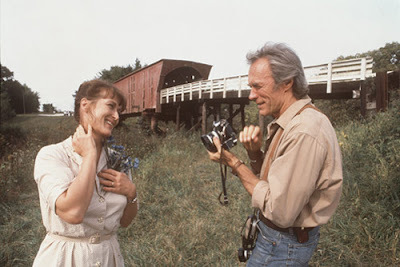 Clint Eastwood's impact can be felt on a number of levels via his tough but tender portrayals in such romantic and platonic love stories like The Bridges of Madison County or Million Dollar Baby to his reinvention and reexamination of the western with Unforgiven or The Outlaw Josey Wales and through the haunting musical compositions he's developed at Warner Brothers' Eastwood Scoring Stage, which he helped save from extinction. 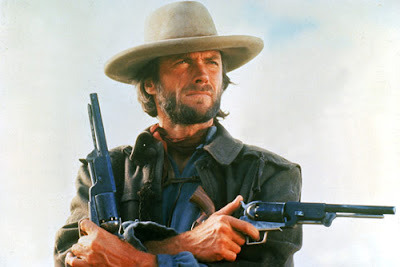 Although he humbly states that the gauge for choosing his material is whether it's interesting to him or he'd want to see the film himself, nonetheless certain patterns have emerged when defining just what is an Eastwood Film. Thematically and plot-wise, he's drawn to tales of moral ambiguity and issues concerning redemption, sins of the past, and the effect of violence on both the victims and perpetrators. As he's able to surround himself with the best and the brightest of actors whom-- as in the case of Mystic River called Eastwood willing to play any part--it's only fitting that he's also attracted to ensemble pieces about makeshift families, outsiders, and those whose culture, history, and points-of-view we often don't often see much in life let alone onscreen. Yet as this diverse collection of thirty-four Eastwood works and Schickel's succinct short reveals-- aside from a certain tonal darkness and gravitation to examining violence whether it's towards oneself (as in the case of Bird) or others-- he's a man who consistently surprises in his choice of material, moving away from crime movies, westerns and war films from time to time to embrace romances, character pieces, and surprising comedies. Despite the fact that John Malkovich's chilling turn in the political assassination thriller In the Line of Fire has remained seared in my memory for more than a decade, I can't honestly tell you if that was the first film I saw that featured Eastwood the performer. One of our true auteurs whose work is being celebrated in an unprecedented manner by a studio rather than a boutique or specialty upscale DVD company, the 35 films contained in the set include many which are available to download and although you won't find his Universal Pictures like Play Misty for Me or Changeling included, it's an extraordinary comprehensive collection that boasts the following films in DVD: Where Eagles Dare; Kelly's Heroes; Dirty Harry; Magnum Force; The Enforcer; The Outlaw Josey Wales; The Gauntlet; Every Which Way but Loose; Bronco Billy; Any Which Way You Can; Honkytonk Man; Firefox; Sudden Impact; City Heat; Tightrope; Pale Rider; Heartbreak Ridge; Bird; The Dead Pool; Pink Cadillac; White Hunter, Black Heart; The Rookie; Unforgiven; A Perfect World; The Bridges of Madison County; Absolute Power; Midnight in the Garden of Good and Evil; True Crime; Space Cowboys; Blood Work; Mystic River; Million Dollar Baby; Letters from Iwo Jima; Gran Torino; The Eastwood Factor (Richard Schicke's Short Film). 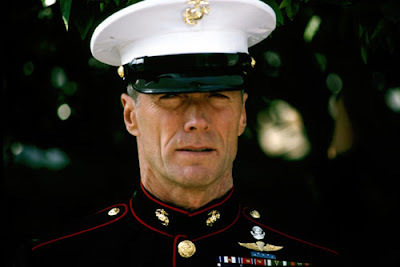 Leaving off his most recent WB title Invictus and without the option of a Blu-ray companion set or Schickel's longer version of both his Eastwood book and documentary The Eastwood Factor, it does make you long for a supplementary set. Yet in the words of Eastwood who's still making a breakneck number of movies in his own unique way, it's his own wish that this “'retrospective' will be out of date almost as soon as it's published” since the man who still drives himself everywhere (with the exception of the Oscars) and has an endless hunger for creative cinematic expression, has signed on for the whole ride, with no plans of stopping until he yells cut. FTC Disclosure: Per standard professional practice, I received the short film and a mini-booklet relating to this title in order to evaluate it for my readers, which had no impact whatsoever on whether or not it received a favorable or unfavorable critique.